Pudding continues to share the intention of her mother, Big Mom. She finds amusement in the impending massacre of the Vinsmoke family. She shoots a Walker 36 Caliber Percussion, a gun that is specially able to pierce the “iron bodies” of the Vinsmoke family. The gun is loaded with “candy-jacketed bullets that can penetrate armor.” She say’s that she can’t wait to see Sanji‘s face when he finds out, she says that Sanji is “ugly and a failure.” Sanji is present for this conversation and begins to cry. Pudding reveals that she ate the Memo Memo no Mi, that allows her to turn memories into filmstrips and edit them. She does this to Reiju. 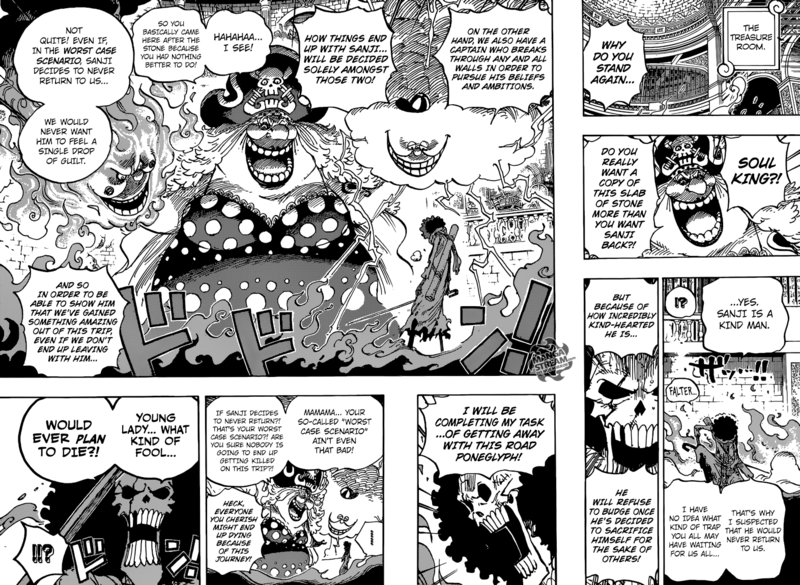 I can’t sake the feels that Brooke is completely outmatched by Big Mom. It seems obvious considering Big Mom is a Yonko, however, Brooke is somewhat immortal. 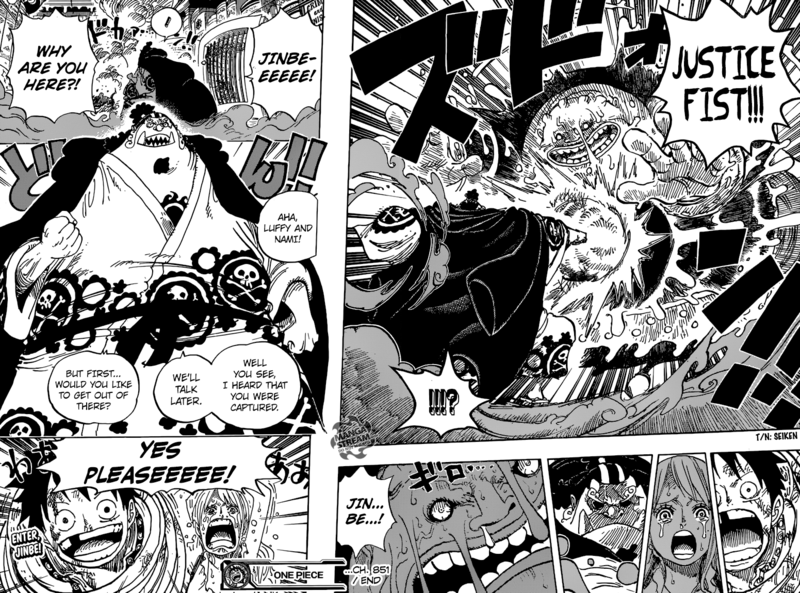 Regardless, it will be interesting to see some of Big Mom’s powers and what her style of fighting is. Big Mom questions why Brooke keeps getting up, she wonders why he’s not going to Sanji but instead trying to get the Poneglyph. Brooke responds that “since Sanji is a kind person, he knows that his crew-mate will likely sacrifice himself and not get rescued for the sake of others.” Brooke believes that if they can’t rescue Sanji, they can at least get the Road Poneglyph. Big Mom suggests that they should be concern with their own deaths. Brooke responds “that death should never be considered when making a plan, calling Big Mom “young lady.” He then prepares to fight by raising his sword. Carrot and Chopper finally get Brulee to talk. She swears that she doesn’t remember where the castle is, but they should as the mirror’s. Carrot and Chopper ask the mirror’s where the castle is located. 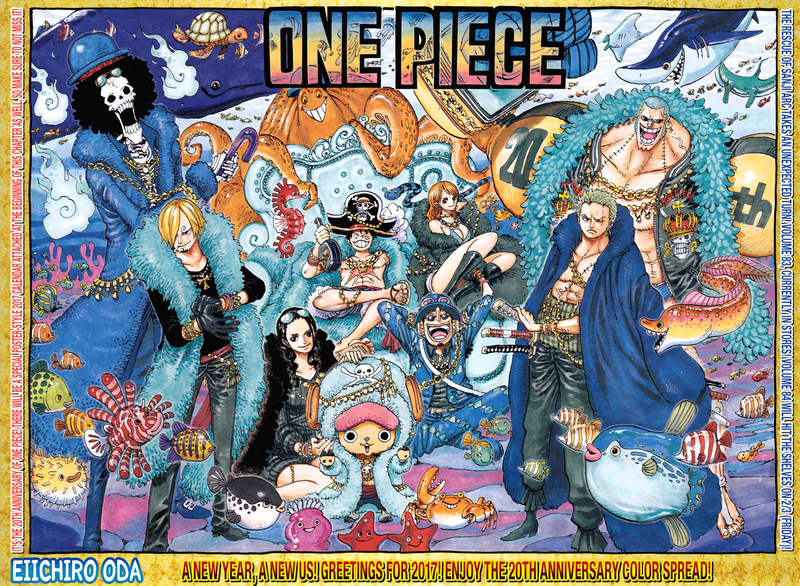 The mirror’s respond and Chopper asks “if any of them are reflecting Luffy, Nami, Brook, Pedro, or Sanji,” but the mirror’s don’t know what any of them look like, save Sanji. Carrot plans on using her drawing skills to create portraits of the Strawhat’s. 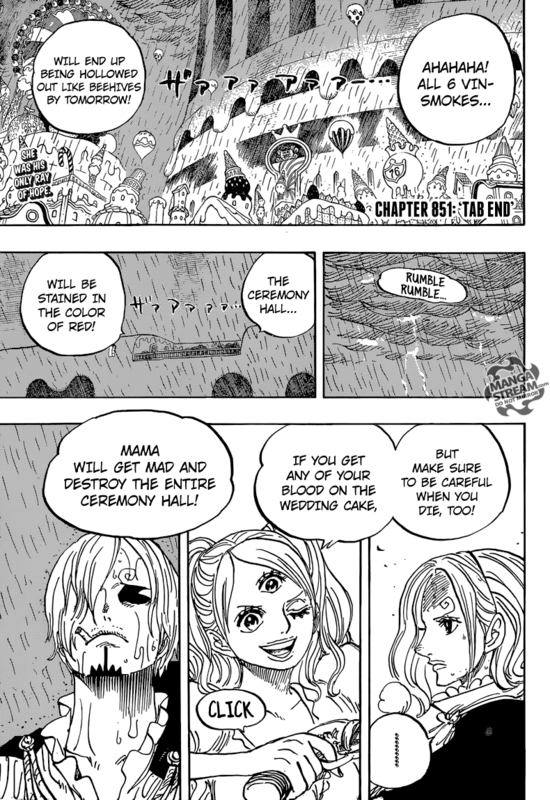 Despite the fact that Pudding removed the memories from Reiju, Sanji does know Big Mom’s plan. However, I think that because Reiju doesn’t remember she may not believe him, and neither will the rest of his family. I think as a consequence most of the Vinsmoke’s will be killed. Brooke seems to be in a dangerous position against Big Mom, but I’m hoping that he will manage to hold his own at least until someone saves him. It is possible that Chopper and Carrot will save him, assuming that the mirror’s don’t trick them. Finally, Jinbe return was a surprise, but I’m excited. He’s one of the strongest characters in the series and is loyal to the Strawhat’s. I can’t wait to see what he does.